A star is on the horizon: Situated roughly 30 miles north of Dallas, Frisco Independent School District (ISD), one of the fastest growing school districts in the U.S., is home to more than 54,000 students across 68 schools, with eight more schools planned to open before 2019. 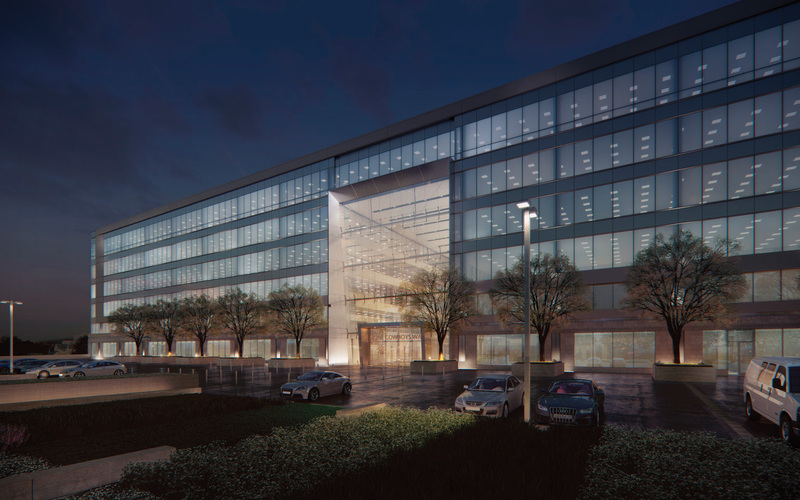 To accommodate this rapid growth, Gensler designed a 25-acre complex comprising a 300,000-square-foot office building, 300-room hotel, and a 12,000-seat indoor stadium known as the Ford Center. 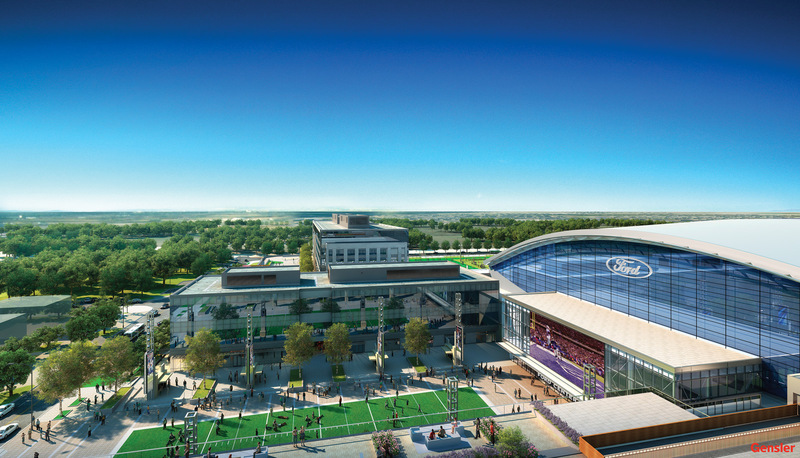 Totaling $1.5 billion, the project is known officially as “The Star in Frisco” and is part of the area’s larger 91-acre mixed-use development. Gensler’s scheme has been hotly anticipated by the local community. The Ford Center’s inaugural event, which saw four football games between teams from Frisco’s ISD on August 27, was sold out a week in advance. 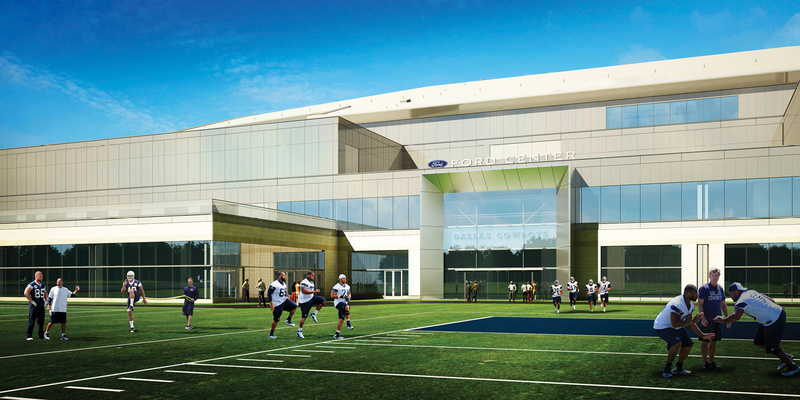 Emblazoned with the Dallas Cowboys’ signature blue—conveniently similar to that of Ford’s—the indoor athletic facility will be used by the NFL team, the City of Frisco, and Frisco ISD’s eight high schools. With a clearance of 94 feet and offering football-shaped locker rooms to be used by both high schoolers and professional football players, it is the only NFL training facility in the country that is shared with the public. a “multi-use event space.” As a result, visitors can expect a vibrant atmosphere at events as sound reverberates around the space. Given the stadium’s parabolic roof, Armstrong also highlighted the extensive gutter system that spans the perimeter to capture water runoff. 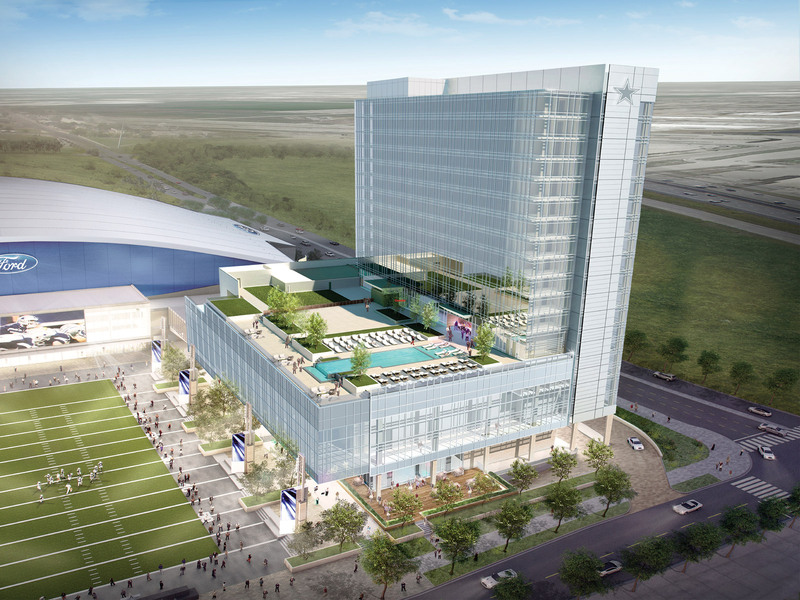 Sitting in the middle of the 25-acre area, the Ford Center will be joined by offices and a “War Room” (a space for football tactics to be discussed) to its right, and an Omni Hotel, retail, and restaurant space to its left. Directly in front of the arena will be a public plaza, complete with a football field (one of three outdoor fields in the complex), which will bridge the surrounding typologies at a pedestrian level. Present throughout Gensler’s project is the theme of openness. In the office complex, a five-story atrium connects the main lobby and entrance to the football field on the opposite side. Aligned with the 50-yard line, the feature provides what Armstrong described as the “wow factor” for the site while also emphasizing the notion of “walkability” within the general area. 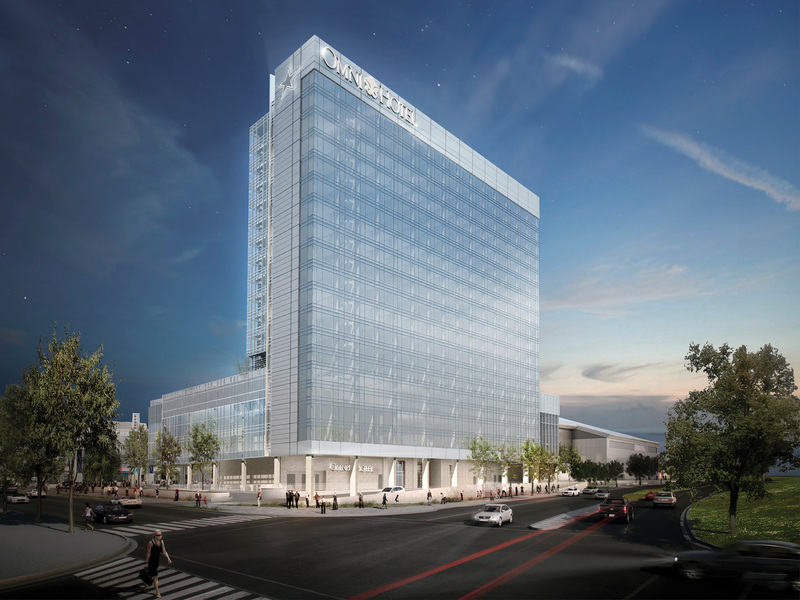 The hotel, known as the “Omni Frisco Hotel” will boast a 13,000-square-foot ballroom, as well as 24,000 square feet of meeting and event space. The luxury hotel will also offer a rooftop pool deck with a bar and grill overlooking the open plaza and main entrance to the Ford Center.